We are your first stop for information and reviews of the best air mattresses, inflatable beds and related products in the world. We review and rate all types of inflatable bed products: for your home, for camping, for kids and sleepovers, for the media/rec room, for a guest room – and permanent air beds for your bedroom. We never work with manufacturers or retailers when preparing our reviews. My team and I do our own independent research and write our reviews before we ever contact a vendor. And, when we finally do contact them, it’s just to ask them to check our facts – but not our opinions! Finally, on our blog we write about how to make sense of this crazy, confusing market we cover. 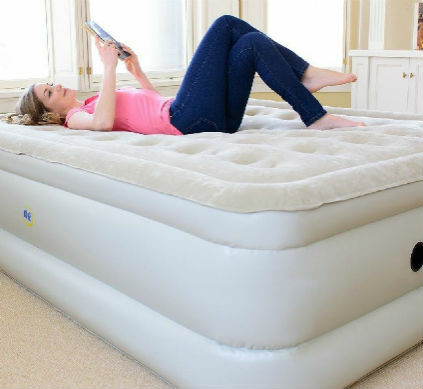 And, we offer tips for cleaning, repairing and maintaining your air mattresses and inflatable beds so you can enjoy them for many years to come. Thanks for dropping by our new website. I hope it helps you find exactly what you need – in a few minutes or less.